Gumby Jams with the Iconic Band RUSH! The iconic Canadian band RUSH has a new documentary, RUSH / Time Stand Still, which debuted in select theaters on November 3 and 17, 2016 in the U.S. and Canada. This fascinating documentary chronicles the final major tour of the legendary rock band. RUSH members love Gumby! So much so, that they featured cuts to Gumby and pals jamming to their first big hit “Working Man” at their theater showings and in their promotions. Check out the Rush Facebook page to see the official jam. The DVD/BluRay released on November 18. 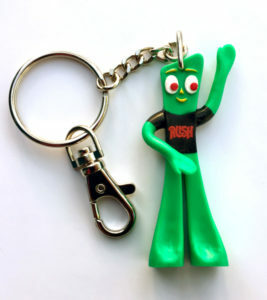 Best Buy has a special edition of the DVD that includes a Gumby keychain with Gumby wearing a RUSH t-shirt. Click here for a sneak peek. You can read more about the documentary here. Gumby has many fans in the music world. We’re thrilled to include RUSH.